Click here for a site that helps children and their parents deal with grief and loss in an appropriate and safe environment. A child’s ability to understand death varies according to his or her age. Older children are beginning to understand the permanence of death, and might associate it with old age or personify it in terms of frightening images or a cartoonish boogeyman. They often know more about how the body works, and have more specific questions. It’s important to answer their questions to the best of your ability, and provide as much specific, factual information as possible. Try to keep them to regular routines, and give them opportunities for the constructive venting of feelings and grief. Teenagers process grief more like adults, experiencing anger and sadness as they begin to cope. Don’t feel disappointed if it seems that they may want to talk more to their friends than to parents, this is normal and can help them to share their feelings and heal. Because their grief is similar to that of an adult, a teenager may take longer to recover from a loss than a younger child. Questions may come up about mortality and vulnerability, and your role is to empathize with them, listen to their concerns, and remind them that their feelings are normal and things will get better with time. Use concrete terms when talking about death. Don’t shy away from the words “death” and “dead”. 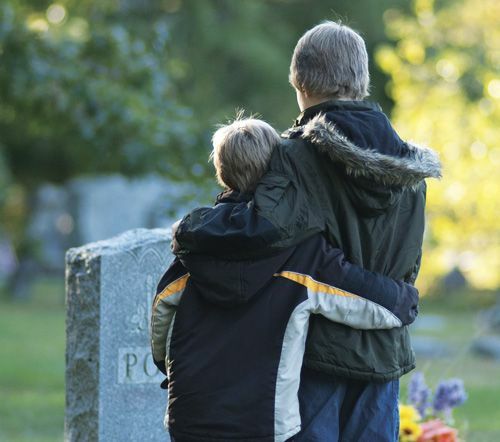 While it might seem gentler to use phrases like “passed away” or “went to sleep”, this can be confusing for a child and lead to difficulty understanding the finality of death. If your child doesn’t understand what death means, try explaining it in terms of the body, such as “Aunt Rachel’s body stopped working”. Be honest when you don’t know the answer. An honest, “I just don’t know the answer to that one”, can be more comforting than a made-up answer or an answer you don’t believe. Listen to their fears and reassure them. Children can develop fears as the result of a loved one’s death. Whether it’s an irrational fear linked to the cause of death, a fear of losing you or another family member, or a fear that something they did caused the death to happen, spend time comforting your children and helping to assuage their fears. Don’t hide your own grief. It’s important for children to know that adults cry when they’re very sad, too, and that their feelings of grief are normal and shared by others. Let them know that you’re okay, and find comfort together by sharing your feelings and remembering the loved one who is gone. If your child seems to be struggling especially hard with a loss, or if grief is seriously interfering with their day-to-day activities, routines, and outlook on life, don’t be afraid to seek professional help or therapy when it’s needed.